Would you believe you can track, and even jam law enforcement radio communications using a pretty pink pager? 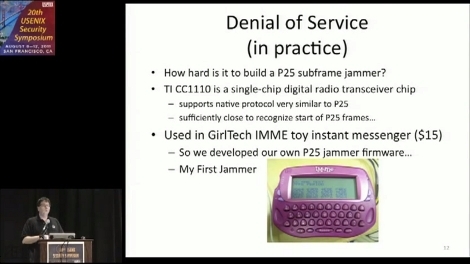 It turns out the digital radios using the APCO-25 protocol can be jammed using the IM-ME hardware. We’ve seen this ‘toy’ so many times… yet it keeps on surprising us. Or rather, [Travis Goodspeed’s] ability to do amazing stuff with the hardware is what makes us perk up. 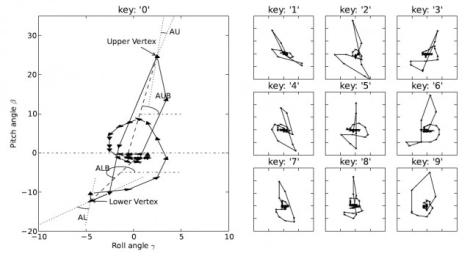 Details about this were presented in a paper at the USENIX conference a few weeks ago. Join us after the break where we’ve embedded the thirty-minute talk. There’s a lot of interesting stuff in there. The IM-ME can be used to decode the metadata that starts each radio communication. That means you can track who is talking to whom. But for us the most interesting part was starting at about 15:30 when the presenter, [Matt Blaze], talked about directed jamming that can be used to alter law enforcement behavior. A jammer can be set to only jam encrypted communications. This may prompt an officer to switch off encryption, allowing the attackers to listen in on everything being said to or from that radio. Along with hobby electronics, flying RC planes is one of [Diederich’s] favorite hobbies. When out in the field, he prefers to use an Aurora 9 radio controller, and while the remote is great, he was a bit disappointed in Hitec’s telemetry sensor lineup. He says that the sensors are pretty decent, though limited, and he was positive he could build a better telemetry solution. His sensor board is completely open source, and comes with a long list of features. First and foremost, it emulates all of the messages that can be sent to the radio controller by Hitec’s off the shelf models, making it a simple drop-in replacement. He uses an ATMega8L microcontroller to run the show, including all sorts of input pins and connectors to support GPS as well as voltage and current monitoring. He has made a DIY kit available for purchase online, but all of the sensor’s schematics and a BOM are available for free, should you desire to roll your own. We love seeing DIYers show up manufacturers in this way, especially when they share the goods with their fellow hobbyists. Nice job! [Ben Grosser] built an interactive painting robot that’s pretty far removed from the LED and Arduino builds we usually see. The robot is adapted from one of the many CNC routers we’ve featured over the years. The control system is written in Python and uses genetic algorithms and a microphone to decide what to paint next. Robot artists have been around for decades now. When [Harold Cohen] exhibited his robotic artist AARON, gallery patrons lined up to watch a robot paint. The paintings were originally just a monochrome line drawing that was later colored in by [Cohen]. 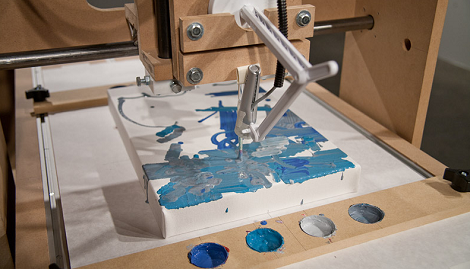 [Ben] made his robot paint directly onto canvas with oil paints, so there’s no question of what the computer intends the final product to be. [Ben] came up with a really neat build, but we’re wondering about having this robot artist on display inside a cavernous exhibition hall. Surely the echos from the servos and stepper motors would be picked up by the mic and interpreted by the painting algorithm. Barring some control systems, it would probably be the robot’s commentary on its own decent into madness. 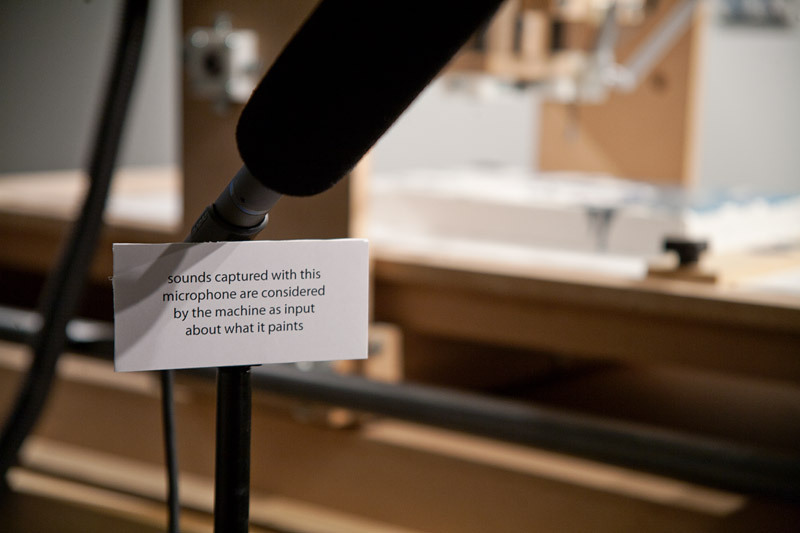 Check out a video of the robot in action after the break, followed by a violin/robot duet the shows how the audio is interpreted. A pair of security researchers have recently unveiled an interesting new keylogging method (PDF Research Paper) that makes use of a very unlikely smartphone component, your gyroscope. Most smart phones now come equipped with gyroscopes, which can be accessed by any application at any time. [Hao Chen and Lian Cai] were able to use an Android phone’s orientation data to pin down what buttons were being pressed by the user. The attack is not perfect, as the researchers were only able to discern the correct keypress about 72% of the time, but it certainly is a good start. This side channel attack works because it turns out that each button on a smart phone has a unique “signature”, in that the phone will consistently be tilted in a certain way with each keypress. The pair does admit that the software becomes far less accurate when working with a full qwerty keyboard due to button proximity, but a 10 digit pad and keypads found on tablets can be sniffed with relatively good results. We don’t think this is anything you should really be worried about, but it’s an interesting attack nonetheless. Hexapod robots seem to be a dime a dozen lately, but we think you will be hard pressed to not be wowed by [Zenta’s] latest creation. He’s built a bunch of hex and octopods before, but hasn’t tried building anything quite like this. 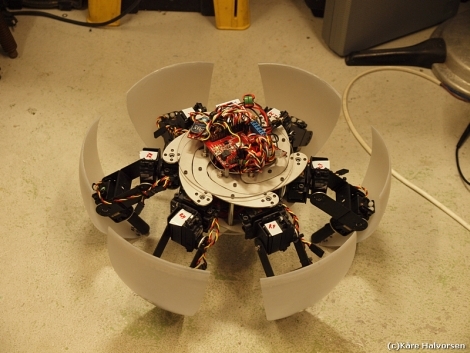 His MorpHex bot might look like your standard hexapod, but once it gets moving, you can see that it’s quite unique. Utilizing over 25 servos driven by a single ARC-32 controller, MorpHex moves in smooth, fluid-like motions, making it almost seem like it’s alive. The inner portion of the body can fan out, extending the overall length of the bot, though it’s more meant to allow the bot to morph into a ball and back, rather than increase its size. In the teaser video below, you can see MorpHex in action, with its parts flowing together more like a jellyfish than any sort of land animal. While [Zenta] is continuing to work on MorpHex’s sphere-morphing capabilities, we think it would make for an awesome and creepy spiderbot!